“We were a little band of almost empty-handed workers literally by ourselves in the wild woods of Virginia, with three thousand suffering men crowded upon the few acres within our reach. 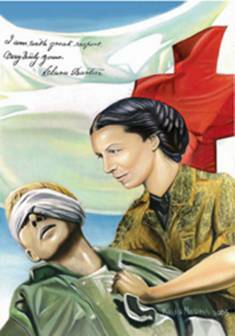 In a word, Clara Barton cared. Historians have cited her and other Civil War nurses as a paragon of caring. “Our interest in the roots of caring as ethical comportment in the face of suffering led us to letters, diaries, and memoirs of Civil War nurses. …These nurses were, in a sense, ‘inventing nursing': their work predated formal nursing education in the United States, and many of them went on to found schools of nursing after the war. They volunteered because it was the right thing to do… The situations they describe were not amenable to "fixing"; there was no cure for the war, for the terrible wounds and disease, or the loneliness and death on every side. What these nurses brought was care: order, cleanliness, and food when it was possible, and simple being with at all times. Source: Emily Hitchens and Lilyan Snow , entitled “ The Ethic of Caring: The Moral Response to Suffering.” Christian Scholar's Review (1994). 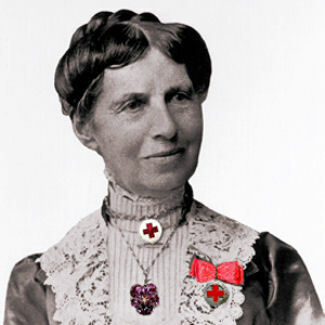 Of all Civil War nurses, Clara Barton is the most famous, because she founded the American Red Cross, which has grown to become a global organization. But this landmark achievement was 20 years in the making. It was at age 40 that she began her lonely quest to help soldiers, and through sheer force of inspiration, she recruited others to her cause for the next 20 years. The following text is excerpted verbatim from the American Red Cross Museum. "Clarissa Harlowe Barton -- Clara, as she wished to be called -- is one of the most honored women in American history for being a true pioneer as well as an outstanding humanitarian. As pioneer, she began teaching school at a time when most teachers were men. She was among the first women to gain employment in the federal government. As a pioneer and humanitarian, she risked her life when she was nearly 40 years old to bring supplies and support to soldiers in the field during the Civil War. Then, at age 60, she founded the American Red Cross in 1881 and led it for the next 23 years. Her understanding of the needs of people in distress and the ways in which she could provide help to them guided her throughout her life. By the force of her personal example, she opened paths to the new field of volunteer service. Her intense devotion to the aim of serving others resulted in enough achievements to fill several ordinary lifetimes." "...Following the battle of Cedar Mountain in northern Virginia in August 1862, she appeared at a field hospital at midnight with a wagon-load of supplies drawn by a four-mule team. The surgeon on duty, overwhelmed by the human disaster surrounding him, wrote later, "I thought that night if heaven ever sent out a[n] ... angel, she must be one-her assistance was so timely." Thereafter she was known as the "Angel of the Battlefield" as she served the troops at the battles of Fairfax Station, Chantilly, Harpers Ferry, South Mountain, Antietam, Fredericksburg, Charleston, Petersburg and Cold Harbor. 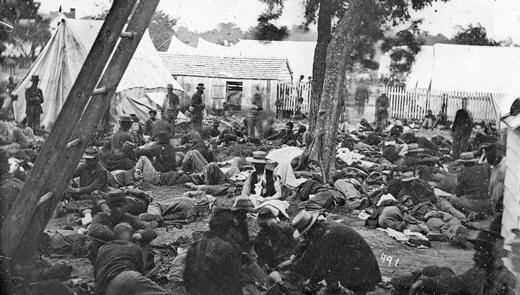 Field hospital in Civil War ... conditions that Clara Barton new firsthand as a nurse. "... At Antietam, she ordered the drivers of her supply wagons to follow the cannon and traveled all night, actually pulling ahead of military medical units. While the battle raged, she and her associates dashed about bringing relief and hope to the field. She nursed, comforted, and cooked for the wounded. In the face of danger, she wrote, "I always tried ... to succor the wounded until medical aid and supplies could come up-I could run the risk; it made no difference to anyone if I were shot or taken prisoner." "... Toward the end of the war, she found herself writing to many families who inquired about men who had been reported missing. Here, again, she recognized a pressing human need and did something practical to address it. In the month before his assassination, President Abraham Lincoln wrote: 'To the Friends of Missing Persons: Miss Clara Barton has kindly offered to search for the missing prisoners of war. Please address her ... giving her the name, regiment, and company of any missing prisoner.' Barton established the Office of Correspondence with Friends of the Missing Men of the United States Army and operated it out of her rooms in Washington for four years. She and her assistants received and answered over 63,000 letters and identified over 22,000 missing men. By doing this, Barton anticipated the implementation of Red Cross tracing services, one of the organization's most valued activities today. "Barton ...proposed that a national cemetery be created around the graves of the Union men who died in the notorious Andersonville Prison in Georgia and that the graves be marked where names were known. With the help of Dorence Atwater, who had secretly tabulated a list of the dead during his own imprisonment in Andersonville, and a team of 30 military men, Barton identified the graves of nearly 13,000 men. She also proposed that some 400 unidentifiable graves be memorialized, thus anticipating the honor now symbolized by the Tomb of the Unknowns. After Barton helped raise the flag over the Andersonville grounds at their dedication in 1865, she wrote, 'I ought to be satisfied. I believe I am.' Coming events were to show, however, that she would never be satisfied except by responding again and again to the call of human need." Clara Barton was a remarkable woman in all that she did and what has transpired since then due her noble efforts ... She was a Great American Patriot in her day and will always remain so.